The Robot Factory by Tinybop is an app which lets kids build, play and collect their own robot creations. My boys helped me review this app, but I've enjoyed playing and creating with it myself. We're big fans of Tinybop at Tech Age Kids and they have lots of interesting apps well worth exploring. Previously Tinybop apps have only been available on iOS, but they have recently launched a number of their apps for Andriod. We think this will make their amazing apps, accessible to more families - good move Tinybop! 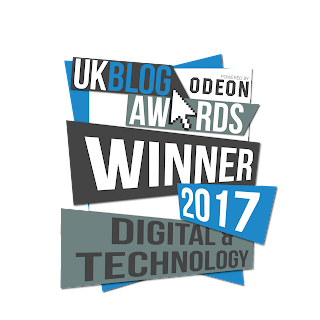 We're secretively hoping they will develop for the Amazon Appstore too! Disclaimer: We received a download code to write this review. As always our views and opinions are our own. This is no longer a thing - Robots are Here! And they are here to stay. Our kids will definitely be working with, designing, building and operating robots in their future. The Robot Factory is No. 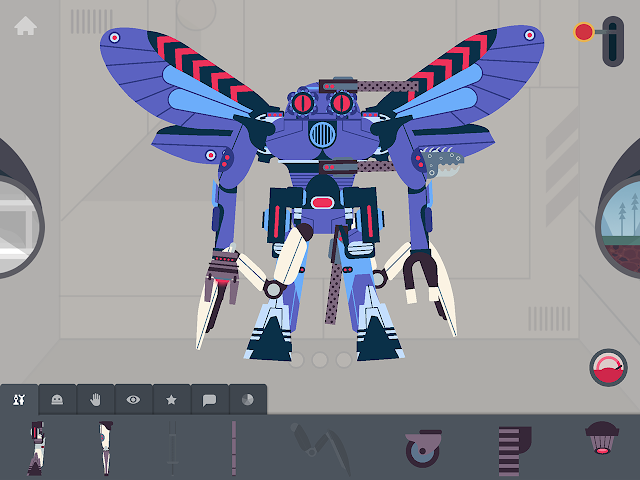 1 of Digital Toys collection of Tinybop apps. Other apps in the collection include The Everything Machine, The Monsters, The Infinite Arcade and Me. 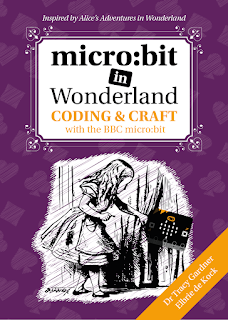 It is an open-ended creative app letting kids create, explore and play with their own creations. The app is recommended from 4+ but would be suitable for younger children to explore with an adult. The illustrations and app sounds are well designed and although kid-friendly not overly kiddie! "I really like that I can make my own character and test my robot in a mini world"
This is the place where you build your robots. And the place my kids enjoyed spending a lot of time designing and making some pretty ridiculous looking robots. They really enjoyed seeing how their creations work in the testing environment and then came back to the factory to make changes. You can also record your voice for the robots in the factory. This is always a favourite option for my kids. The factory also has a switch to see how your robot moves. Code of Ethics No. 4: Try things you've never tried before. There are many solutions to one problem. You can keep all the robots you create in the Robot Showroom and then take them out for improvements or test them in a world filled with obstacles. Psst. Pull the light switch in the showroom to see your robots glow in the dark. Code of Ethics No. 7: Save your best ideas in secret notebook. How well will your designs stand up in the "real world"? Once you've designed your robot you can test it by driving or flying it through a world filled with obstacles which you need to avoid or engage with weapons. If you are not happy, you can go back to the factory and make adjustments. Code of Ethics No. 1: Be Industrious. Build, test, repeat. All Tinybop apps come with a handbook. 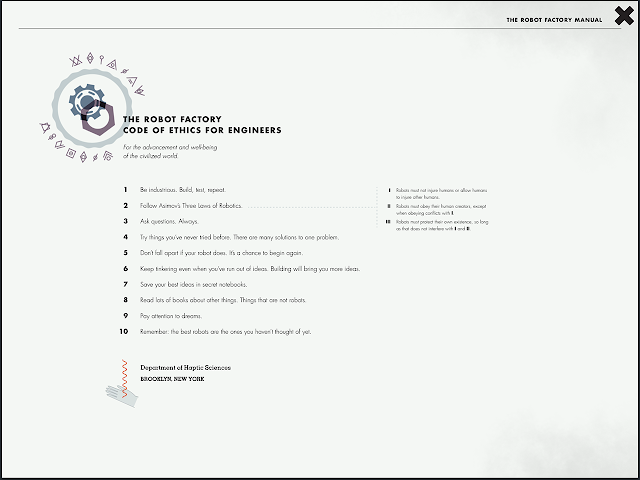 And The Robot Factory handbook is not a disappointment. 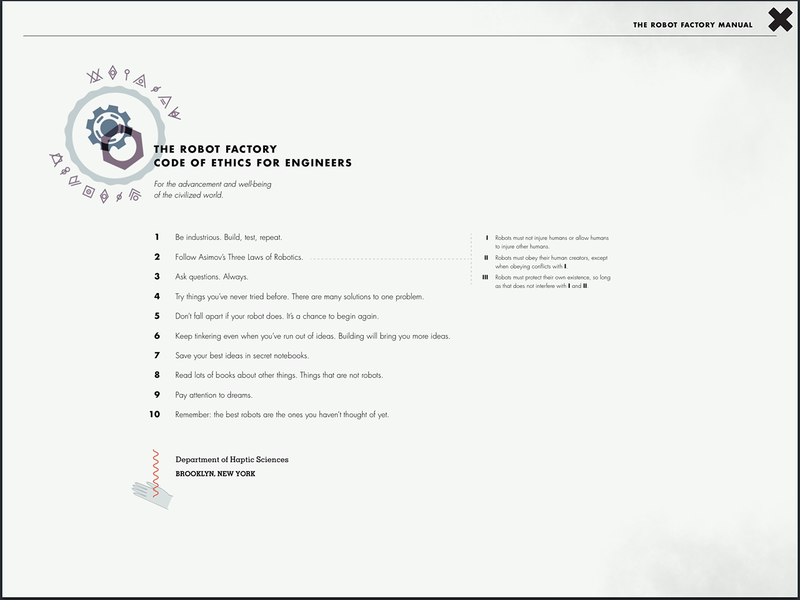 The Code of Ethics for Engineers at the beginning of the handbook is worth sharing with the kids so they can think about and design robots in a way that is useful for humans. The handbook also describes the different robot parts including their characteristics for designing. Code of Ethics No. 10: Remember, the best robots are the ones you haven't thought of yet. Not all the Tinybop apps are yet available on Andriod. Currently, the award-winning Explorer's Library apps are available on Google Play, including Homes, Weather, Simple Machines, The Earth and Skyscrapers. You'll get a 7-day free trial of the apps and will have to download the Explorer's Pass first to subscribe and activate the free trial. Thereafter it would cost £8.99 per year to access all the Explorer's Library apps. 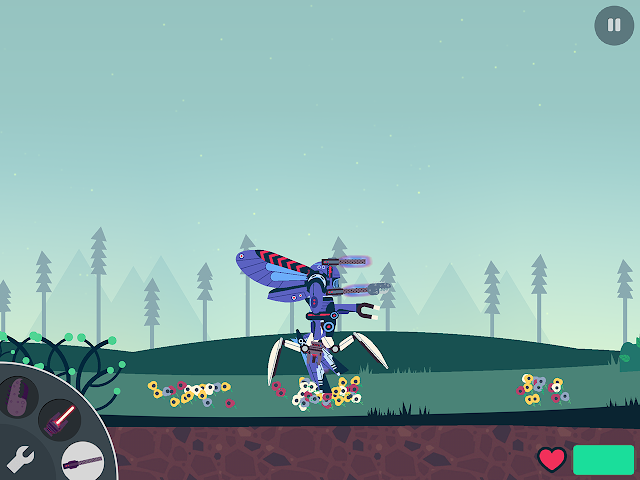 Other Tinybop apps in the pipeline for Andriod is Space and The Human Body. 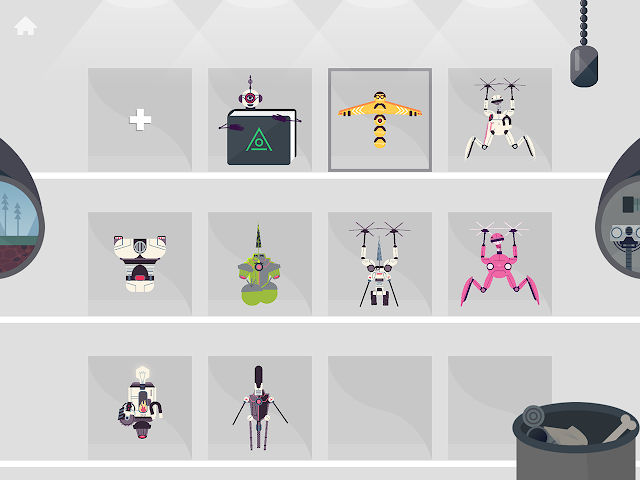 The Robot Factory is not yet available on Google Play. 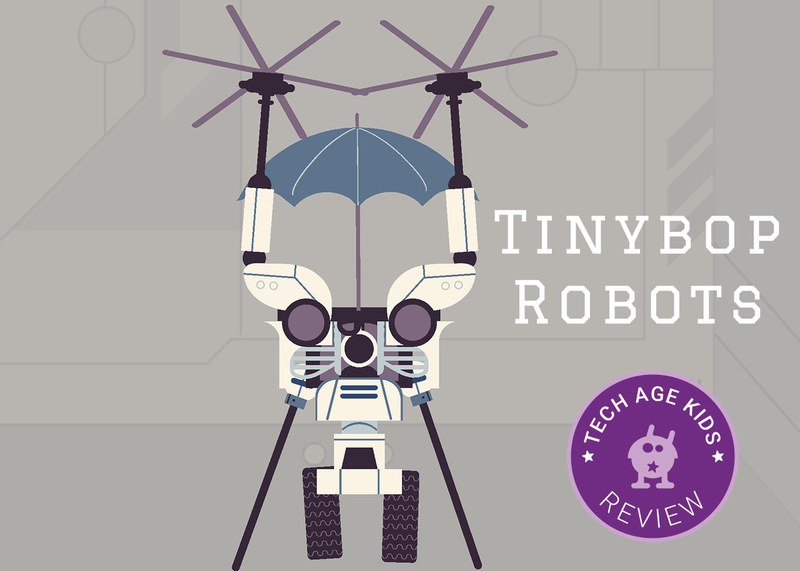 We love Tinybop apps for kids. They are beautifully illustrated and engaging for both parents and children. 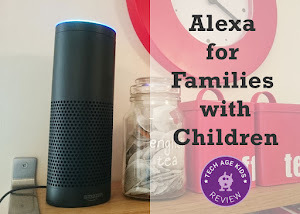 The fact they are being developed now for Andriod is really good news for families. 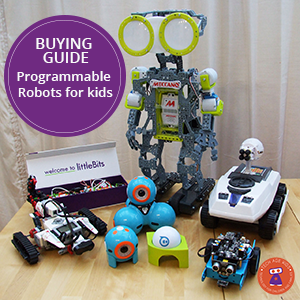 The Robot Factory is a way for kids to "play" with robots and explore how different parts fit together and work in the "real world" before they get the point on building their own robots one day! I also love that you can have different profiles on a single app installation. My kids like designing and collecting their own robots and comparing robot galleries. It's a bonus the illustrator for The Robot Factory is from the UK and we love his dream of having a robot dog! Perhaps Owen Davey would like our Roby robotic dog, designed and made by Tracy's 8-year-old.